– Cut a cheap cut of pork (in this case, pork loin) into large chunks, removing as much fat as possible. – Put it in a slow cooker with the entire contents of a 500mL bottle of your barbecue sauce of choice. Stir. – Cover and cook for four hours on high, until the meat pulls apart easily with a fork. – Remove the meat from the cooker, pull it apart/shred it with two forks, and then return it to the cooker. Mix the meat back into the sauce. – Cook for another hour on high. The end result tastes really good, but it takes very little effort. 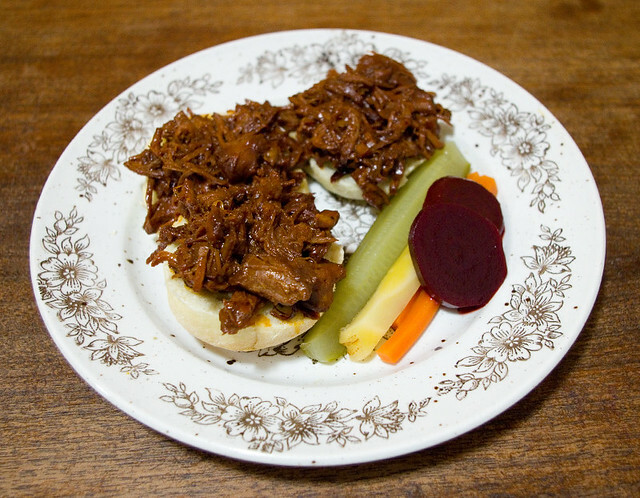 I served the pulled pork in open-faced sandwiches that I made with homemade dinner rolls. Lest you think that it this took a great deal of effort, I just put the ingredients into the breadmaker and let it do most of the work. I used the Dinner Roll recipe from page 176 of Betty Crocker’s Best Bread Machine Cookbook (1999). Now, once the kneading is done, I did have to form the rolls by hand and bake them in the oven, but it was only about a dozen and a half of rolls, so that didn’t take long. I served the open-faced sandwiches with some of my homemade pickled beets, dilled carrot spears made with some of my monster carrots, and dill pickles. The acidity of the vinegar cut nicely through the sauce of the pulled pork. We’re not quite at the stage where machines can do all of the cooking for us. However, having the option to just thrown ingredients into a something automated and then leave it ’till it’s done is a saving grace when you’re under the weather.